Cedar Rapids police dog Marco. 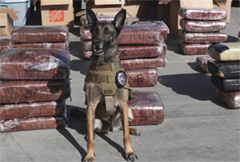 A police dog is getting credit for a big drug bust in Cedar Rapids. Marco and his handler, officer Al Fear, were conducting a routine check at various businesses this week when Marco “hit” on a garage. Officers obtained a search warrant and found over 500 pounds of marijuana in the garage. Police spokesperson Sergeant Cristy Hamblin says the K-9 is trained to sit and wait for a reward when the dog sniffs out illegal drugs. The Cedar Rapids Police Department’s K-9 Unit, which includes seven dogs, is supported by community donations.